Ole! With frequent weekend jaunts to out of town, I realized that I had not written thoughts on recent sports events like the World Cup or the Tour de France. All blogs were headed that way and spiced up by dear Paul the psychic octopus now turned global superstar. The trips to the country's southern cities though work related and not particularly relaxing were interesting. For one, I have tasted one blueberry cheesecake that's to-die-for along with cafe mocha that somehow did not activate the acidity of my stomach. Just like the designer coffee havens in Manila, this featured cafe is situated along a buzzing strip for nightlife citizens who would as well find here dinner restos, wine bars, and an outdoor live band concert stage. Obviously, nighttime activities have moved to this part of the city. 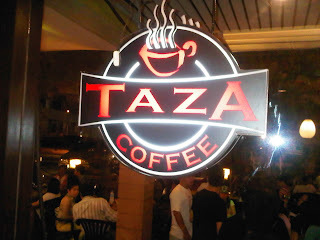 My cherie wondered whether the name of this coffee shop was a take off from a recognizable brand or was already bordering on plagiarism. Perfect chill out setting together with (as usual) netizens blazing away on their Facebook pages. Come and visit this fascinating city known for its unique whitewater rafting adventure. I won't tell you where this cafe could be found -- part of the fun in this blog -- but a prize awaits the first comment with the correct answer. Cebu is another favorite destination considering the Manila-like comforts that abound from hotels and restos to taxis and shopping malls. It can be quite pricey however especially if you decided to stay in those Mactan resort enclaves. It has been raining at night when I was there this weekend but where doesn't and on occasions it had also rained over there on January (Sinulog festival time). Overall and if you are not going for business, Cebu City is a very safe destination for holiday seekers. Davao City sprawls and because of that does not pretend to be preoccupied as much as Cebu City or Metro Manila. Despite numerous visits here, I have always wondered where the center of nightlife is located in Davao as it has never been visible to me or to someone around my demographic. They have a recent coffee chain called 'Cafe di Chicco' that serves respectable coffee (varied) and food. Some patrons even take their pets along and that's tolerated by the establishment. I'm sure the alcohol is somewhere. Places for weekend meetings ot trysts. Haul your mysterious date/s out there [meet for the first time over there] and if he picks up on the invitation, that's your cue for some exciting days ahead. Forget about Boracay in the meantime; it's overrated and arduous if you've been going quite frequently. Let's hope your mysterious date is cute -- but you can mitigate that, can't you? Hey Nyl. Good to hear from you -- almost around your birthday? Will send an email to find out where I could send the present. Happy birthday. Hello Drew. Good to hear from you.